This Sunday, June 1, and Monday, June 2, a miracle of sorts takes place on mainstream TV as PBS affiliates broadcast a documentary about a heroic Catholic priest. 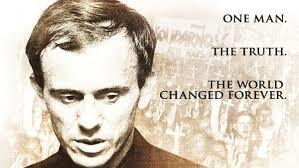 Messenger of The Truth is about Blessed Father Jerzy Popieluszko, chaplain to the Solidarity labor union that nonviolently took down the communist regime in Poland. Some efforts to describe this documentary are a little dry, but Father is utterly compelling. Above all, he loved the person of Truth Himself and he loved his fellow and sister Poles more than his own life. Today, as we struggle to secure true freedom, Father Popieluszko is a model because he shows us the meaning of Catholic integrity. At the 1945 Yalta Conference, British Prime Minister Winston Churchill and U.S. President Franklin Roosevelt handed Poland over to Soviet Premier Joseph Stalin, when they had no right or authority to do so. Two years later, Jerzy Popieluszko was born to faithful Catholic parents in that very country and he would become the Kremlin’s No. 1 enemy. In 1966, young Popieluszko began serving his compulsory two-year term in the Polish People’s Army. There, he refused to stop praying the Rosary and other prayers. There, he refused to take off his scapular. There, he was punished severely and it took a toll on his physical health for the rest of his life. As the story goes, by the 1970s some 95 percent of Poland’s 38 million people were Catholic. Nazis and then Communists had tried to crush the Catholic Church by arresting, torturing and murdering her priests and religious sisters, but Polish Catholics kept the faith. Awestruck that one of their own had been elected the Vicar of Christ, after Pope John Paul II’s visit to Poland in 1979, Catholics formed the labor union Solidarity. In 1980, workers from Huta Warsaw Steel Mill wrote to their bishop asking for a church. He named Saint Stanislaws Kotska Church and Father Popieluszko was chosen to be their chaplain. Popieluszko was their priest, their spiritual advisor, their teacher and their strategist. He was a friend their families and set up an intricate network to help them survive. The steel workers even asked Father to help design their flag, then he and 20,000 workers marched in Warsaw to the church announcing Solidarity, which nearly every Polish worker joined. After that, the Kremlin appointed General Wojciech Jaruzelski and other brutes to crack down on the Poles. He announced martial law, sent Secret Police to spy on every church, and ordered the Solidarity offices destroyed. Jaruzelski arrested some Solidarity leaders and had others killed. Nevertheless, Poles flocked to the Masses said by Father Popieluszko 10,000 at a time because, Janusz Kolanski said, that’s where they felt free. “Messenger of The Truth” was written by John Moody and Roger Boyes, who had worked as journalists for Time magazine and The Times of London, respectively. It’s based on their 1987 book The Priest and the Policeman: The Courageous Life and Cruel Murder of Father Jerzy Popieluszko. Both men appear in the film along with other eyewitnesses, including officials from the Polish Communist Party. In the movie, Solidarity leaders Lech Walesa and Karol Szarduski speak of Father Popieluszko’s phenomenal impact. Father’s driver, Waldemar Chrostowski, recalls the kidnapping of his beloved friend. Father Popieluszko’s brother, Jozef, recounts the sorrowful task of identifying his brother’s dead body, whose face was beaten beyond recognition. Martin Sheen narrates the film, but it is the voice of Father Popieluszko that inspires me like it inspired the Polish people. If you want a better life in America, learn from a master by watching Messenger of The Truth. It airs in some cities on June 1 and in other cities on June 2. The PBS channels and show times are listed online at www.MessengerofTheTruth.com. Anita Crane is an independent writer and editor with a B.A. in Catholic Theology from Christendom College. Catholics are 25 percent of the U.S. population and she writes to encourage America's largest religious bloc to defend human rights. See more at anitacrane.com.